When you have a bad argument, the only way to win is to corrupt the decision-making process. And that’s exactly what the fossil fuel industry does: in order to feed their greed for massive profits, the oil, gas, and coal corporations buy support for their polluting practices. A recent Financial Times article (subscription) noted that “[t]he oil and gas industry was subject to the most prosecutions for bribery and graft in the UK of any sector over the past four years” and that “most of [these cases] involved payments made abroad, or kickbacks to foreign government officials.”. In the United States, regulations and legislation to promote transparency and fight corruption was opposed for years by the oil industry. The worldwide trend of corruption surrounding oil and gas projects is well documented. The United States is no exception to this global rule. The fossil fuel industry undoubtedly has a stranglehold on U.S. democracy, bribing elected officials with campaign contributions and pressuring them with millions of dollars of spending in strong-armed lobbying. In return, the industry is provided massive subsidies while raking in mind-boggling profits and giving their executives lavish compensation packages. Oil companies in particular have been enjoying boom times, while many Americans struggle. 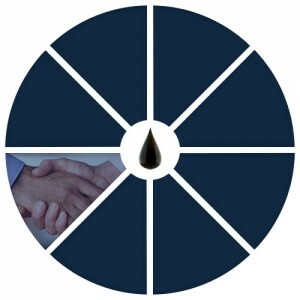 In just the first half of 2012, the five biggest oil companies earned $62.2 billion in profits. That’s $341 million each day. So it is clear they have plenty to spend on corrupting politics to feed their greed. Between January 2011 and June 2012, dirty energy companies spent at least $43.5 million on influencing federal elections in America. This figure includes money spent not only on contributions to sitting members of Congress, but also to congressional candidates who lost elections, presidential races, and the money flowing into Super PACs that cannot go directly to candidates but funds ads and campaigns, giving us a better picture of how much money these companies spend. And that figure quickly and dangerously skyrocketing as the 2012 Presidential election season picks up. What’s more, the fossil fuel industry spends millions upon millions lobbying the members of Congress that they spend so much money in helping to get elected. 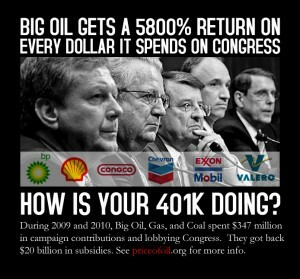 In 2011, the oil and gas industry alone spent nearly $150 million in lobbying Congress. 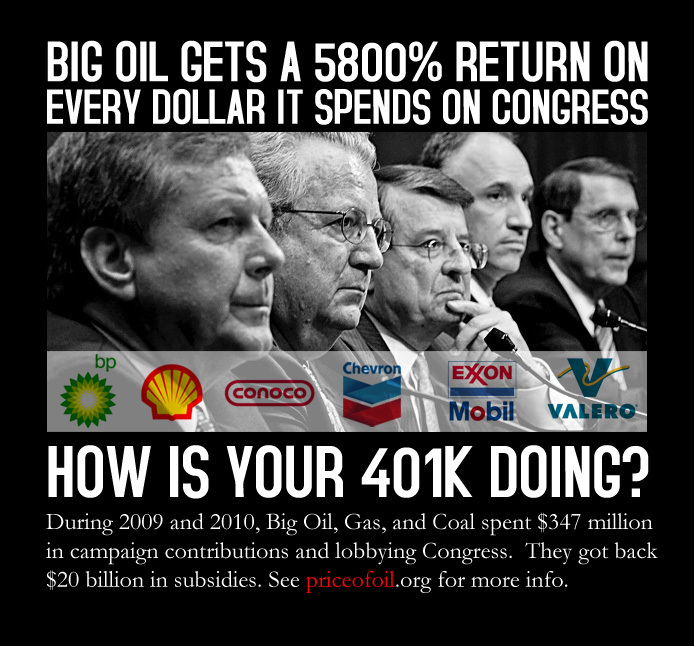 In fact, by our measure, big oil gets a 5800% return on the money it spends on Congress through campaign contributions and lobbying. That’s right – $59 for every $1 they put in! When any industry is spending this much money influencing elections and the legislative process, there’s no question the process will be distorted. And we see it in the millions of dollars in taxpayer handouts (aka subsidies) they milk out of Congress each year. And while Americans struggle to get by, the climate heats up due to emissions from fossil fuels, and Congress pours subsidies to their industry, fossil fuel industry CEOs swim in cash by way of exorbitant salaries and compensation packages. With so much money to gain and politicians in their pockets, the fossil fuel industry is corrupting our government and force-feeding a status quo energy policy that will lead us to climate catastrophe.